Homelessness and the Housing Crisis are concerns close to Steven’s heart. As well as being Director of Development for our diocese and co-lead (with Fr Dominic) in our Caritas Diocese of Brentwood, Steven Webb serves as a trustee for www.csan.org.uk and knows how serious this matter has become. 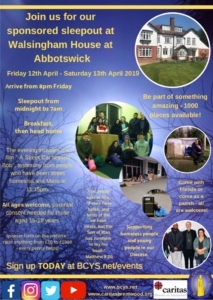 The sponsored sleepout on Friday 12th April is supporting young people & homeless people in our diocese. Since November hundreds of people in Essex and East London have found warmth, food and shelter in church halls and other projects supported by our diocese. Steven is keen to recognise and support the work of countless parishioners who support and accompany homeless people. Our diocesan Caritas does not just work in isolation and at national level we are a part of CSAN which has been working hard with the Bishop’s of England and Wales to formulate a strategic approach to these issues.